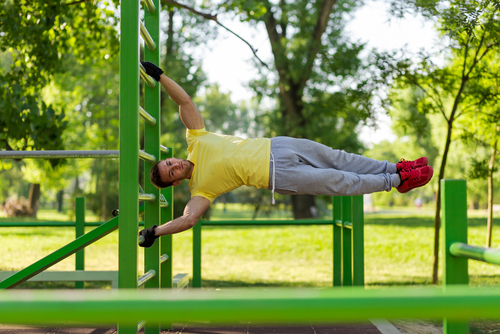 Calisthenics brings back memories from childhood for most of us, the days of doing pushups, pullups, situps and other bodyweight exercises in gym class. Calisthenics is exercise that uses your bodyweight for resistance, which can be very effective at both weight loss and gaining muscle mass if done properly. Calisthenics are also versatile in that not only can you develop and entire routine solely based on exercises rooted in calisthenics, they can also be used in tandem with other routines as well. One major reason why is because calisthenics require no equipment, so you can seamlessly transition from one type of exercise to another. Calisthenics can be used during high intensity interval training workouts in between sets to keep up your heart rate, further shedding those pounds. It is also a great way to get more diversity in to your workout, and giving all of your muscle groups a chance to get activated in one way or another. What Are the Major Benefits to Doing Calisthenics? Many of the exercises that are used in calisthenics require multiple muscle group activation to carry out the exercise, and give similar benefit to combination weight lifting exercises like dead lifts, squats, and military press commonly done at the gym. This give you a more well rounded look that makes sure you aren’t focusing too much on one area while neglecting another. Everyone has seen the guy at the gym with the monster biceps or shoulders who also walks around with chicken legs. His body doesn’t look properly proportioned and just looks funny. If you’re going to invest all of that time and effort into exercising, don’t make yourself look stupid by making the same mistakes that those guys have. When it comes to powerlifting or just trying to develop overall strength, it is easy to neglect the secondary muscles. This is because on machines that allow you to lift more, they tend to stabilize the weight for you. This is great when trying to pack on mass to areas like your quadriceps and hamstrings for example, but you neglect those stabilizing secondary muscle groups in the process. If you are a bodybuilder or just lifting to get ripped and look good, you are obviously going to care if these muscles aren’t developed as they won’t be as noticeable. If you exclusively lift for strength you should care as well however, as these muscle can assist you in beating your old max. Next time you are at the gym throw in a calisthenics exercise in between sets to hit those secondary muscles! One of the best benefits to calisthenics is that they require no equipment so you don’t have to spend money to do them, and they can be done anywhere. No matter what your schedule is calisthenics can fit your need whether you travel and can’t get to the gym, or if you just simply don’t have the time. In professional sports, athletes are always trying to gain an edge when it comes to strength and speed. The problem with this is that through conventional training like weightlifting, you gain strength sometimes at the expense of speed, and definitely at the expense of agility. Not only that, but although weight training isn’t deemed to be dangerous, professional athletes routinely hurt themselves in the gym causing them loss of playing time and potential earnings. Calisthenics allows them to both build strength and does so in a safe manner which limits injuries much more so than weight training. If you are not a professional athlete or in the best shape of your life, don’t think that calisthenics aren’t for you. Calisthenics is one of the most versatile exercises and is easily modified to accommodate anyone of any fitness level. For example if you are a really advanced athlete, you may be in shape to the point where you could do one armed pull ups. Alternatively if you are just starting out, you can do the exercise with two hands with your knees on a chair for additional support. Calisthenics definitely is a great way to begin your fitness journey, or to give you an extra performance boost if you are a seasoned athlete.